The HoM awards went to Dave Cummings, and Paul Sugden. Congratulations to them. They will receive technical running shirts from HoM sponsor UP & RUNNING. There were over 40 Harriers in the senior race, with some excellent individual results and the ladies winning the team prize, and 36 in the junior races. A big Thank You to all the marshals and helpers who helped the event run very smoothly. Full results and photos here. Paul Sugden was 351st in 80:30, a PB by 3m25s on the same course last year. Heavisides Henry finished 6th in the M55 1500m in 5:06.68, but didn't run in the 3000m due to injury. Well done to Victoria Stevens who finished 239th in 31:51 in the senior women's race. Was anyone else out racing this weekend? Dave Wilby reports ... a trip down to see the outlaws coincided ever so nicely (how convenient!!) with the Muddy Woody 6 trail race near Hereford. I've done this a few times before and it's a great early season blast, with plenty of quick running on fire-roads, singletrack blasts through the trees, and a whole host of ankle deep gloopy climbs & descents, with the odd stream crossing to cool you down and clean you off!! John Pullen from organising club Wye Valley went off quicker than I was prepared to, and stayed in front all the way to claim victory, while I had a fantastic battle with a young whippet from the local club. He kept chancing his arm on the slippery descents, and I'd have a go back on anything pointing upwards, and in the end we came to the final climb shoulder to shoulder. I had a good go up through the thick mud and luckily enough came off the top with just enough of a gap to crawl along the last few hundred yards of flat running and claim 2nd place. A grand morning out in the rain and mud. From Henry Heavisides ... It was quite a breezy morning for the early start at Dewsbury, although the overnight rain had stopped. 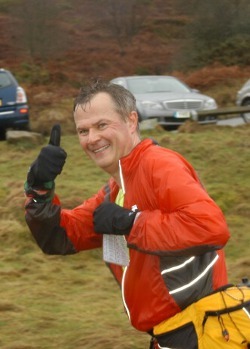 There was a good representation of Ilkley Harriers for the first road event of the 2011 Harriers Race League. It was a close finish between Sally Morley & Rob Cunningham for the honour of being first Ilkley runner. Sally just managed to win the sprint to the line. Times generally were quite a bit slower than previous years as a result of the wind, which strangely seemed to be against us both going out & coming back. Special mention to Paul Sugden who raced today after a 16 mile training run yesterday. Nicky Jaquiery reports ... 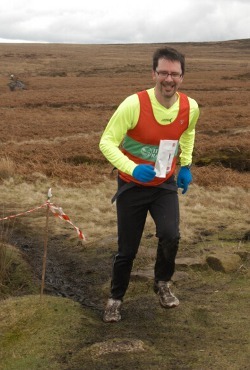 I ran in the Mickleden Straddle fell race on Sunday (13.8 miles/1980'). I've run this race twice now, the last time in deep snow and this time in extremely strong winds. There was no respite even on the descents where it was physically impossible to run downhill! Nicky Spinks was the first woman home in 2hrs 14mins and I was the second V40 in 2hrs 30mins. Have I missed anyone from the results? This is a 2011 Harriers Race League event, so please let me know. Joyce Marshall reports ... My eighth time running the Rombalds Stride turned out to be a bit of an epic but great fun. After a very sociable start seeing many Ilkley Harriers as we all ran up and over Baildon Moor I was just settling down to a steady pace when I realized I had a problem with one of my shoes. Several attempts to secure the sole using the string from my card and plastic tape from one of the checkpoints could not defeat the sucking bog mud and I ended up running a mile shoeless to Keighley Gate. I retired and headed back to Guiseley just in time to see the first finishers coming in � well done Graham! Having donned another pair of shoes I managed to get a lift back to Ilkley (with the same kind gents from Raynet) and off I trotted back up to Keighley Gate where the rest of my family (who were walking) had just checked in. I finished the walk with the family � a very different but equally enjoyable experience from the usual run. To quote Wallace �a Grand Day Out�! Make your mark on the celebrations for Ilkley Harriers 25th Anniversary! Ilkley Harriers will be 25 years old in May 2011. To celebrate this occasion we would like to invite all senior members and their children, Junior Harriers and their families to design a commemorative item which the club will produce a limited edition run of for sale at the summer Birthday event. The entries will be judged by The Ilkley Harriers Committee at the March committee meeting. Winners will be announced at the club night on Tuesday March 15th.